The Atlantic & Yadkin Greenway (formerly known as the Lake Brandt Greenway, Battleground Rail Trail, and Bicentennial Greenway) is a 7.5 mile greenway and rail-trail built upon the abandoned Atlantic-Yadkin railroad bed.The tracks were part of the Cape Fear and Yadkin Valley Railway which extended from Wilmington, NC to Mount Airy. Greenboro’s only rail-trail, the trail passes by several county parks, Lake Brandt, and offers several opportunities for commuting and recreation. An approximately 1.4 mile section of the trail was funded through a $1,028,000 Transportation Enhancement Award. This funding was matched by $257,000 in local match funds. These funds were used to construct the trail from Markland Drive to Pisgah Church Road. 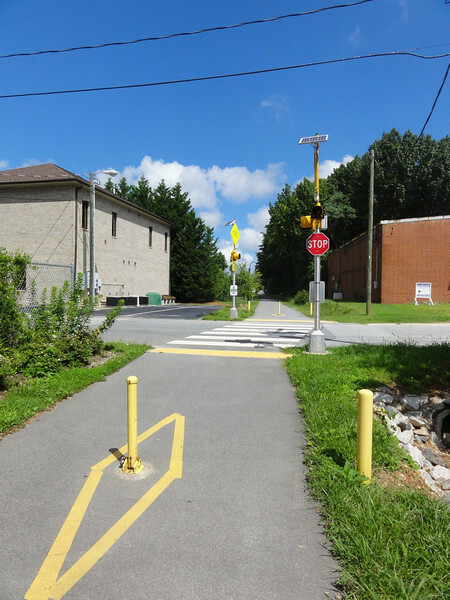 There are plans to extend the trail to the Downtown Greenway in Greensboro.